Maybe you caught my StyleBlueprint Nashville take over or you’ve seen my recent Instagram stories, but it’s no secret, Nicky’s Coal Fired is by far one of my Nashville favorites. From their delicious housemade pasta to their craft cocktails and crispy coal-fired pizza, I’ll gladly order one of everything on the menu. When I heard the news of bomboloni, breakfast pizzas, and mimosa kits, I knew where I’d be on Sunday morning! Brunch at Nicky’s is not for the faint of heart. Grab your girls or your foodie tribe and so you can sample everything. Dishes are hearty, so bring your A game appetite. Kick off your Sunday Funday appropriately and order a Mimosa Kit. This is perfect for those who like to mix your own mim as it’s served with a bottle of prosecco and a carafe of juice. If you’re anything like me, I’m heavy on the bubbles with just a splash of juice. Still recovering from last night’s shenanigans? Nicky’s has you covered with an assortment of caffeinated concoctions. Now that the beverage situation is under control, let’s take a moment and peruse the menu. First things first, you can’t have brunch at Nicky’s and not order their famous bomboloni. In just a matter of weeks, the word has gotten out and these delightful Italian doughnuts are selling out quickly after they open. With options like Nutella and Lemon-Mascarpone, you don’t even need to ask. If you aren’t already in a food coma (which I’d be shocked if you weren’t), it’s time to make your way down the menu to the Brunch Za’s. Tony and Caroline have created one of the best breakfast/hangover pizzas I’ve had. Inspired by one of the breakfast classics, Waffle House, I introduce the Scattered, Smothered, Covered and Chunked pizza. Chef Tony uses a white pie base and covers it with roasted onions, ham, mozzarella, cheddar and tops it with an egg. Absolute breakfast perfection. Not exactly in the mood for a breakfast pizza ( I can’t fathom that, but…) Nicky’s has some of their regular pizzas making an appearance during brunch service. My favorite is the St. Pasquale, I can’t get enough of that giardiniera. Be still my heart! Rounding out my brunch recommendations is Jerry’s Steak and Eggs. While this may be a classic brunch dish, Chef Tony sources the steak from local purveyor, Porter Road Butcher, and it absolutely melts in your mouth. Served with two eggs over easy, you may find you a nap is in order. There you have my favorite brunch bites at Nicky’s Coal Fired. 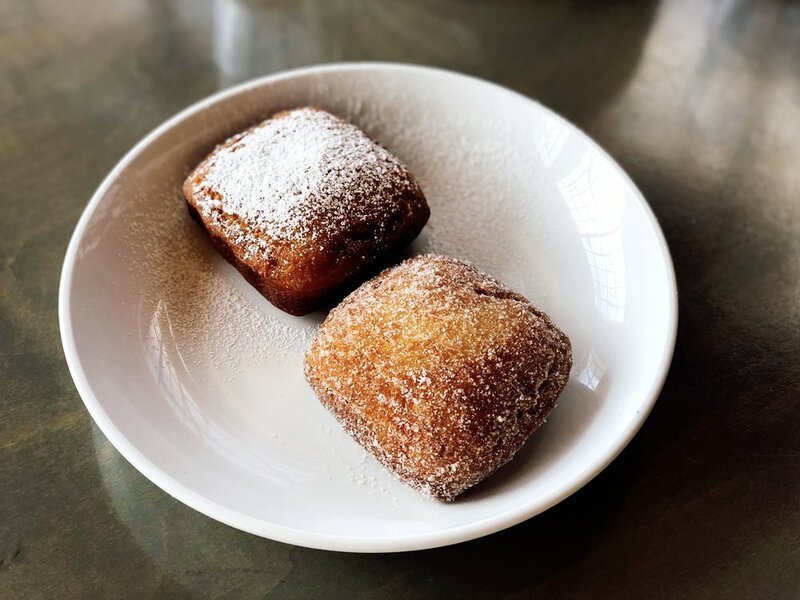 While they currently don’t take reservations for brunch, make sure you get there early so you can snag those bomboloni! Below you will find a copy of the brunch menu. Let the eating begin! Can’t Miss: The little Chris and the Scattered, Smothered, Covered and Chunked were by far my two favorites. But, if you’re in the mood for something with a kick go with the St. Pasquale and ask for extra giardiniera. Potential Pass: The only thing I’d pass on is wearing form fitting clothes. Take it all in and enjoy!